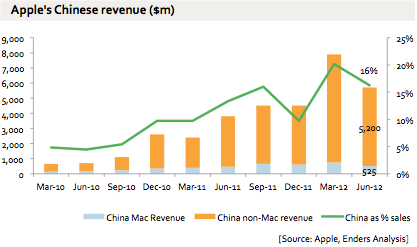 Every quarter on the conference call, Apple discloses its Chinese revenue, to a round number. In the June quarter this was about $5.7bn - 16% of the total. It was down sharply on the cyclical slowdown of iPhone sales: the iPhone 4S went on sale in China in the March quarter. Since Apple also discloses Apac revenue and Apac Mac unit sales, and we know the Mac ASP, we can back out a pretty solid estimate of Chinese Mac and non-Mac (i.e. iPhone and iPad) revenue. We don’t know the iPhone/iPad split, but we can make a reasonable guess at the ASP ($5-600 for each): iPhone sales of 5-6m units and iPad sales of 3-4m would be consistent with these figures.